If your main sewer line is broken and full of roots, dirt, and other debris, a snake may not be able to break through and unclog the drain and you may need to repair or replace your sewer line. Rather than dig through your entire yard to replace a broken sewer line, it is often possible to do a trenchless sewer line replacement. You'll want an experienced, professional plumbing company in Bakersfield to rely on to handle this project. 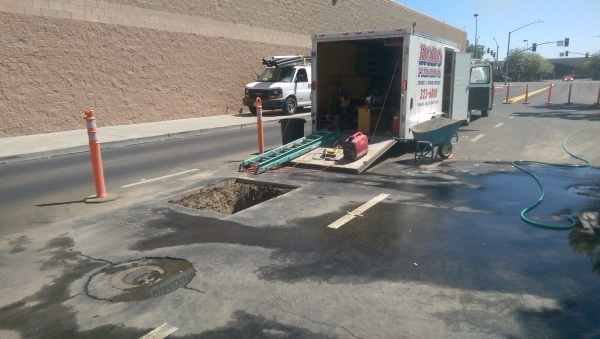 Using the newest trenchless plumbing technology, our experienced Bakersfield plumbing technicians can locate your sewer line and run a new replacement pipe through the existing old pipe without having to dig through the entire area. If you think your main sewer line needs repair, don't hesitate to call Robo Plumbing for a free estimate on a trenchless sewer line replacement. Call (661)323-6000 today for your free estimate! When it comes to professional plumbing companies in Bakersfield, with Robo Plumbing you'll know you made the right decision. Interested in Trenchless Sewer Line Services?